There are a lot of crazy Lego builds out there. This Rubik’s Cube solver, or this hypnotic ball contraption, for example, give you an idea of just how technical some of these projects can be. 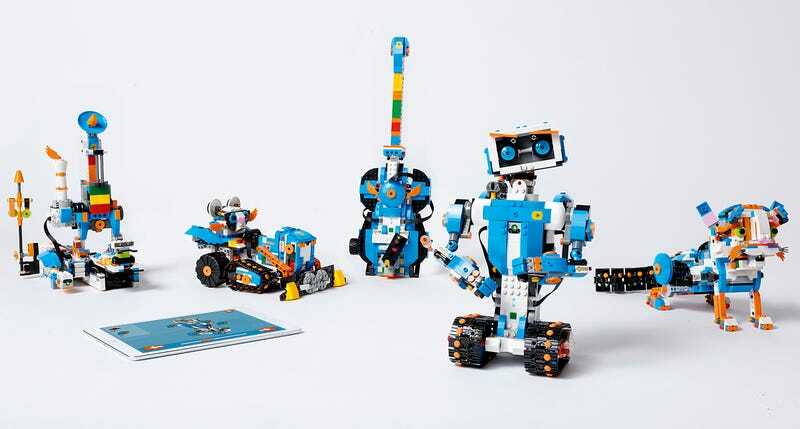 Now, Lego is finally making robotic toys for everyone who’s too lazy to learn to code. Lego Boost is a new construction toy kit that includes 840 standard bricks, a color and distance sensor, a power hub with an embedded tilt sensor, and a single motor—all of which can be used for building robotic projects. We had a chance to play around with the new builds for about an hour, and let us be the first to say that these are going to be wildly popular. What makes the new Lego Boost kit unique is that it also has a companion app that lets you drag and drop different actions rather than having to write every single line of code while programming. This is a huge timesaver to say the least, and it also eliminates one of the biggest barriers to entry for kids (or adults) who are interested in building robotic toys. The kit comes with five different projects out of the box: a cat, a robot, a guitar, a bulldozer, and my personal favorite, a Lego-stacking machine. The companion app walks users through how to build each of the various projects and allows them to unlock new activities along the way. For example, the cat will learn to wag its tail and eventually drink milk from a bottle. Similarly, the guitar project lets you unlock new sounds and eventually record audio to use during improvised jam sessions. Each project has about a half dozen actions that can be unlocked through the app. When you unlock different actions for each of the projects, you can then drag and drop them into any number of different arrangements. There is a huge play button inside the app that runs through the series of actions you’ve just lined up on screen. You can save different action sequences, say for example, how to navigate the robot through your kitchen, and you can also customize each movement by diving into more technical parts of the app where the code is revealed. Lego Boost is basically meant to serve as a gateway into robotic toys. The directions are incredibly easy to understand, and there are even milestones you unlock while building projects—so you’ll know when it’s a good time to take a break. The payoff is awesome once you finally build something and can make it perform different actions. Lego did a great job of including actions for all of the different builds, and more importantly, giving tinkerers an option to dive into the code and mess around if they’re feeling adventurous. We played with all of the different projects about an hour, and it’s safe to say this is an excellent toy kit—especially for anyone who loves the Lego Mindstorms projects—but might be a little intimidated by the programming requirements. I can’t say with certainty how hard these projects are to build, but my very unscientific guess would be that they only take a couple of hours. Lego claims the new kit is made for ages 7 and older, and frankly, they seem very easy to build especially with the app there to guide you through the process. A couple of highlights during my time playing with Lego Boost: Using the included color sensor to make a playable harmonica with the guitar and a homing missile with the robot; making the cat purr by picking it up and triggering the tilt sensor; and driving the bulldozer around using really basic (and somewhat difficult) controls. It’s really hard to put into words all of the different possibilities, but most of the best stuff stems from the unique components that come in the box. The color sensor, the motor, the distance sensor, and app make this unlike any other Lego kit I’ve ever played with, and it’s certainly something you should check out if you’re interested in robotic toys.